For Christians and Muslims alike, Jerusalem is an architectural wonder. It is also a living, vital city whose accomplishments in mass housing, public monuments, private dwellings, and urban planning rival those of the venerated past. 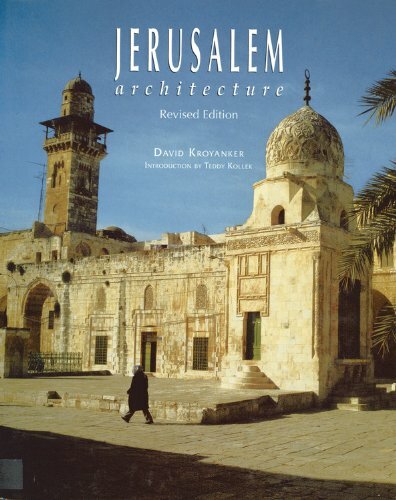 This book is the first complete one-volume survey of architecture in Jerusalem, beginning with the vestigial remains of the First Temple Period, the Roman and Byzantine eras, the arrival of Islam, the Crusader Kingdom, the Mamluks, and the Ottomans. For Jerusalem, the modern age began in the mid-nineteenth century with the first vigorous surge of new building since the 1600s, when Suleiman the Magnificent had the city fortified with the splendid circuit of high crenelated walls that give Jerusalem its legendary fairy-tale look. Written by a leading Israeli preservationist and architectural historian, under the auspices of the Jerusalem Institute for Israel Studies, this invaluable book comes fully illustrated, with a brilliant array of maps, drawings, and photographs, hundreds in color and most of them specially commissioned. While tracing the architectural history of Jerusalem from earliest times to the present, Kroyanker covers not only the city's long history but also its many noteworthy buildings succinctly and with illuminating insights. The author examines the "structure and texture" of the ancient city and its development through the Ottoman period. Building in the new city by different ethnic groups is then discussed, followed by a discussion of the urban planning under the British Mandate. The period from 1948 to 1993 provides some particularly interesting views of the attempts to incorporate modern architecture into the ancient fabric of the city. While the book's numerous beautifully reproduced illustrations are a pleasure to look at, Kroyanker's knowledge makes reading the text very worthwhile. This is a volume for specialists and general readers alike. ?Martin Chasin, Adult Inst., Bridgeport, Ct.